We adapt our solutions to aptly meet your requirements. We transform your ideas into results by designing, developing and localizing your content. 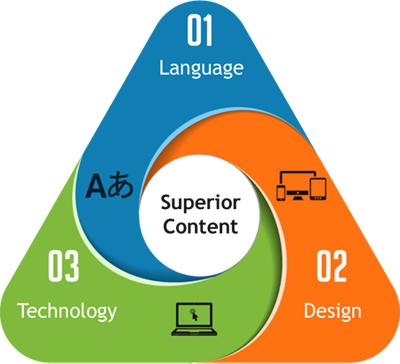 We make your content meaningful by combining Language + Design + Technology. We call it our Synergy Model. We adapt our solutions to aptly meet your requirements. Curious to know what we do? If you want to exceed technological boundaries and take your business to a global level, you must globalize. Braahmam enables you to do this by helping you to speak and understand the language of your target audience. You need an expert who can accurately translate and localize your content into different languages, while carefully considering cultural distinctions. With Braahmam, you can rest in our ability to do exactly that! Our team of experienced linguists, editors and project managers ensure the successful launching of your products and services – without any financial setbacks or goodwill loss. Even the best products and services fail because of an inferior User Experience (UX). UX is about how a customer feels while using your digital offerings. This may include designing and developing digital learning solutions, Mobile Apps, Web Apps, publishing, or digital marketing solutions. You need a perfect blend of design and technology to enhance the experience of your user. Design is not just about aesthetics; it’s about your content, visuals, interaction, accessibility and usability. Technology and design integration is essential to the development and delivery of future-ready solutions. Braahmam’s panel of seasoned Subject Matter Experts (SMEs), content writers, instructional designers, developers and quality analysts ensures a balanced approach to design and technology. Our goal is to enhance your digital offering with an outstanding digital user experience that encompasses accurate information and simplicity.